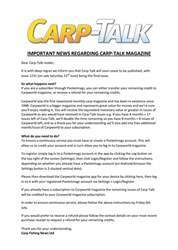 This week’s issue of Carp-Talk (issue 1050) is available to download now. 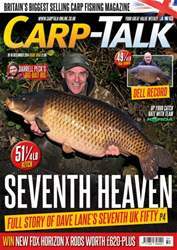 The great Dave Lane leads the catches this week with his second UK fifty of the year with the fantastic Kitch of Northey Park at 51¼lb. Frank Cunningham lands a 49lb mirror from Kingsmead No. 1 Lake, and we’ve got forties from Cambridgeshire, Devon, Berkshire and Shropshire amongst many others. 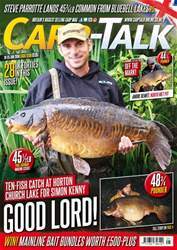 Mike Hamer endeavours to think outside the box, Rob O’Brien makes changes for winter, Darrell Peck explains his big-boilie rig, and Kevin Grout is in ‘A-Z’. 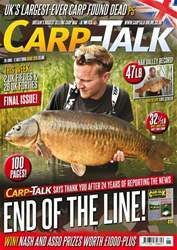 Rogier Smit recalls a trip to a big pit that was worth the effort, Alex Lister reflects on a memorable overnighter on Acton, and Iain Macmillan rediscovers that you can’t get it right every time. 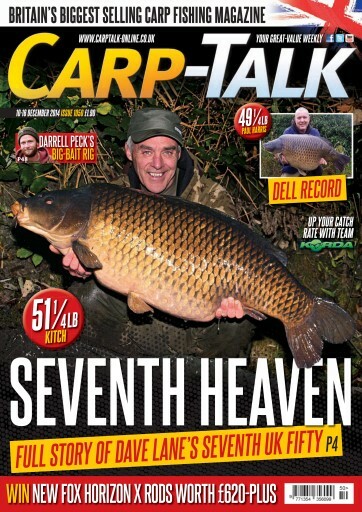 The Fox-Mainline Carp Angler of the Year competition continues, and there is £620-plus worth of Fox rods to give away.